I would like to enter your Photo of the month contest with the attached photo! They are playing in the Puyallup River in Washington State-one of our favorite spots! 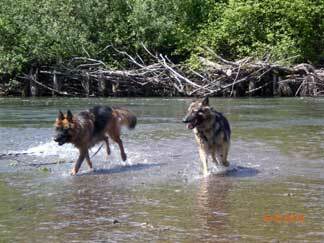 Total German Shepherd: Thanks so much for sharing the great shot of your German Shepherds playing in the water. All my GSDs love the water too. And it's great exercise too! Thanks again - keep the pictures coming.